During the 1914-1918 war the University Examinations School in High Street was used as a military hospital (3rd Southern General Hospital) and military personnel who died there were buried in the newly created War Graves Section of Botley Cemetery. In the 1939 – 1945 war, the Churchill Hospital became a specialist military burns hospital. Military personnel who died there were buried in War Graves Section, along with POW’s who died in POW camps close to Oxford. 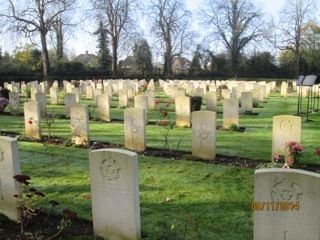 The War Graves Section was also used for airmen who had died and had been attached to RAF stations in Oxfordshire and Berkshire. The War Section of Botley cemetery is one of the largest war graves in Britain and is maintained by the Commonwealth War Graves Commission. It contains the war dead of British, Commonwealth and European countries. There are 746 service personnel buried in the cemetery, (745 men and 1 woman, a Nurse, who it is believed was serving at a local military hospital), who lost their lives in the wars 1914-1918 and 1939-1945.